Tobacco cultivation contributes to deforestation in the Global South while cigarette butts cause poisoning in forests as well as forest fires. Get a quick overview on the impact tobacco has on the world’s forests with our factsheet. Worldwide 32.4 million tonnes of green tobacco are produced on 4 million hectares of agricultural land every year. After curing, these are 6.5 million tonnes of tobacco leaf. Tobacco growing heavily depletes the soil. Thus, farmers need to apply fertilizers extensively or to develop new fertile fields. For the latter, forests are cleared in tobacco growing countries like Tanzania. But the deforestation caused by curing the green tobacco leaves of the Virginia variety is much more serious. This variety is a major component in the widely known American Blend cigarettes and is dried in hot air. The leaves are hung in a barn in which the air is heated by hot flues (flue-cured). The furnaces are fed by firewood. Every year, this process uses 8 million tonnes of fuelwood which is mostly obtained from surrounding forests.The consequences are particularly severe for the miombo woodlands, a large dry forest belt in southern Africa. In tobacco growing areas of Tanzania, tobacco accounts for 3.3 to 6.5% of deforestation. Estimates for Zimbabwe are 14% and for Malawi even 26%. After smoking, cigarette butts most commonly are littered, also in forests. In years with long dry seasons, smouldering or lighted cigarette butts time and again cause forestfires. 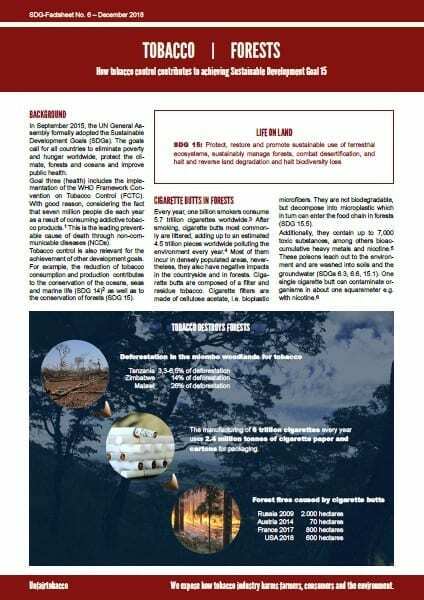 Our new two-pages factsheet contains some examples and explains also other consequences of tobacco product waste in forests. Furthermore, you’ll get to know how tobacco control measures can contribute to protect the environment. Order your printed copy or get your free PDF download. This factsheet shows how tobacco growing, cigarette manufacturing and cigarette butts are affecting forests worldwide.